In 2003, the Pittsburgh Penguins took 18-year-old goaltender Marc-Andre Fleury with the first overall pick of the NHL Draft. Now 28 years old and in his ninth NHL season with Pittsburgh, Fleury has become the winningest goalie in Penguins franchise history. Fleury opened the 2012-13 season by earning his 227th win in a Penguins uniform, passing Tom Barrasso to take sole possession of first place on Pittsburgh’s all-time wins list with a 3-1 defeat of Philadelphia on Saturday. "It’s flattering," Fleury said. "I think it shows I’ve played with a lot of good teammates and good players. Tom Barrasso was a guy I always looked up to. To pass him is an honor for me." One of those teammates and players Fleury alluded to is Penguins captain Sidney Crosby, who was thrilled his friend got a big win that rewrote the record books – especially in his first game back in Philadelphia after an uncharacteristic performance in last year's playoffs against the Flyers. "That’s awesome for him and it says a lot about how successful he’s been, since he’s gotten here," Crosby said. "He gives us a chance to win every night and we're really happy that he got that, especially here. We had a tough series here last year, so to come back in this building and help us get a big win, we’re all really happy for him." 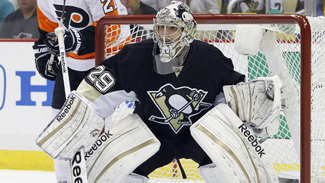 Fleury agreed that getting the record in Philadelphia makes it even better. "We have such a good rivalry with these guys, so to do it today was nice," he laughed. Fleury made his NHL debut the same year he became the third goalie in league history to be taken first overall in the draft, playing in the Penguins’ season opener on Oct. 10 vs. Los Angeles. The rookie netminder had quite a welcome to the NHL, stopping 46-of-48 shots – including a penalty shot from the Kings’ Esa Pirnes. Though the Penguins lost that game, Fleury earned his first NHL win in his next start on Oct. 18 vs. Detroit, making 31 saves in a 4-3 win over the Red Wings. Fleury has since become the Penguins’ franchise goaltender, leading Pittsburgh to the 2009 Stanley Cup championship after making it to the Stanley Cup Final the previous year. The agile, quick and athletic goaltender nicknamed “Flower” by his teammates became the 7th-youngest NHL netminder to 150 wins (25 years, 249 days) on Nov. 12, 2010 vs. Tampa Bay. Fleury, who was an NHL All-Star in 2011 and won Olympic gold with Team Canada in 2010, has 22 career shutouts – tied with Barrasso for most in franchise history. Fleury also ranks second in team history with 41 playoff wins (Barrasso, 56) and five playoff shutouts (Barrasso, 6). Fleury recorded the second (42, 2011-12) and third (40, ’06-07) most single-season win totals in team annals (Barrasso, 43, 1992-93), and owns the franchise record for longest shutout streak of 150:14 from March 24 to 27, 2011. In addition, Fleury has posted at least 35 wins in five of his last six seasons. The only year he didn’t was in 2007-08, when he was limited to just 35 games with a high-ankle sprain. His longest win streak is 11 games (Nov. 17 to Dec. 11, 2010) and his longest unbeaten streak is 14 games.